This gargantuan sculpture by 86-year-old Columbian artist Fernando Botero—aka ‘the world’s greatest living artist’—is a massive presence in The Drawing Room of The St Regis Kuala Lumpur. 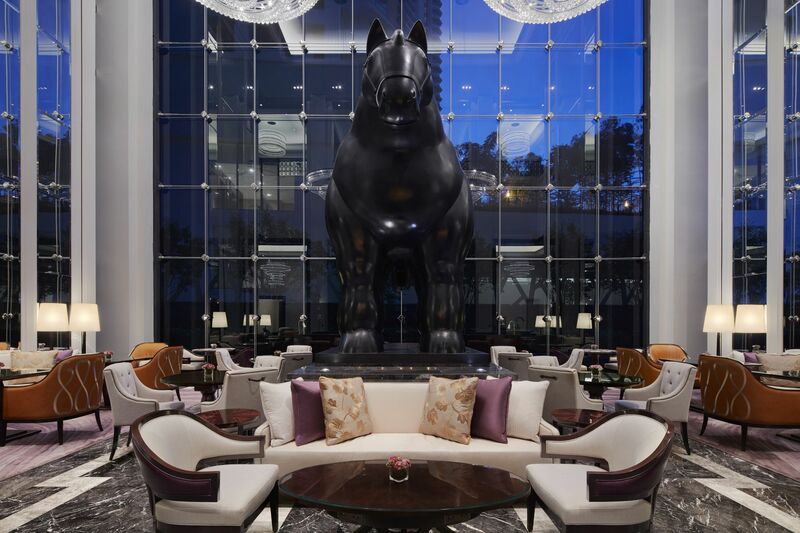 Simply titled ‘Horse,’ Fernando Botero’s sculpture in the The St Regis Kuala Lumpur has been peering down at admiring art enthusiasts since 2015. In fact, hoteliers Carmen and Carmey Chua designed the Drawing Room to accommodate the specially commissioned sculpture. Somewhat besmirched by the black market dealings of Pablo Escobar in the 1980s, Medellín is, on a sunnier note, affectionately christened ‘The City of Eternal Spring’ for its moderate seasons. Columbia’s second largest city is also the birthplace of Fernando Botero (19 April 1932). Botero was so infatuated with Pablo Picasso that he turned up on his idol’s doorstep in Aix-en-Provence in the 1950s, though sadly, to no avail. Their ‘encounter’ finally took place in 2017 when Botero was invited to display his works side-by-side Picasso’s posthumous paintings. On the opening day of the exhibition, Botero requested a moment to himself. Positioning himself before two paintings, one of his own and one by Picasso, the artist allowed waves of emotion to wash over him. Harbouring a soft spot for horses, Botero heralds the beast for its strength, form and familial ties. “Some of my earliest childhood memories are of horses, especially of my father who rode on horseback for his business,” he remarked. Botero’s girthy subjects and grandiloquent style reflect the artist’s zest for life. “There is an exaltation of volume in my work. An orange I create is more of an orange than a real orange. In this sense, the world I create goes beyond reality. It is an exaltation of reality and a celebration of life,” explained the artist. Almost grazing the chandeliers in the Drawing Room of The St. Regis KL, Botero’s monumental work is not only his first in Malaysia, but also his largest equine sculpture at 3.6 x 3.5 x 1.8 metres. 40-foot trailers and a 7.5 tonne forklift were required to transport ‘Horse’ to the hotel in 2015. Book afternoon tea at The Drawing Room to admire the iconic sculpture to in the flesh. Visit www.stregiskualalumpur.com to learn more about the five-star hotel’s wordly art collection. The Scene Dato’ Sri Bernard Chandran Outdid Himself With His Latest Petang Raya Collection, Bravo!